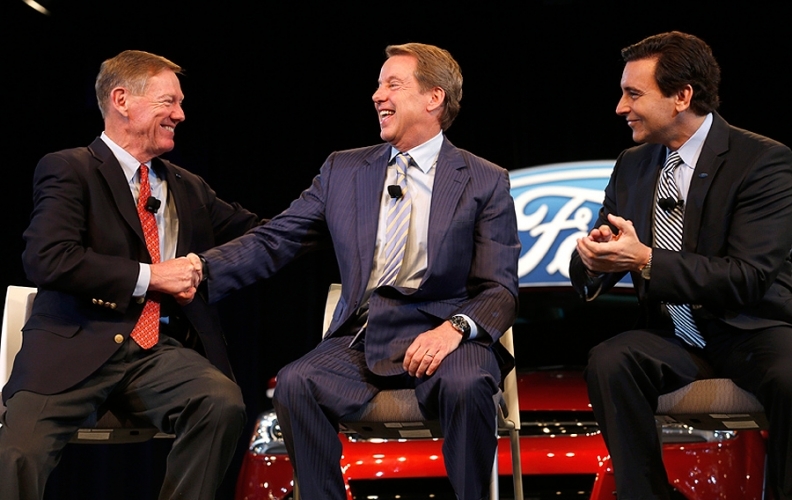 Alan Mulally, Bill Ford and Mark Fields celebrated the transition of Ford leadership at a news conference today. 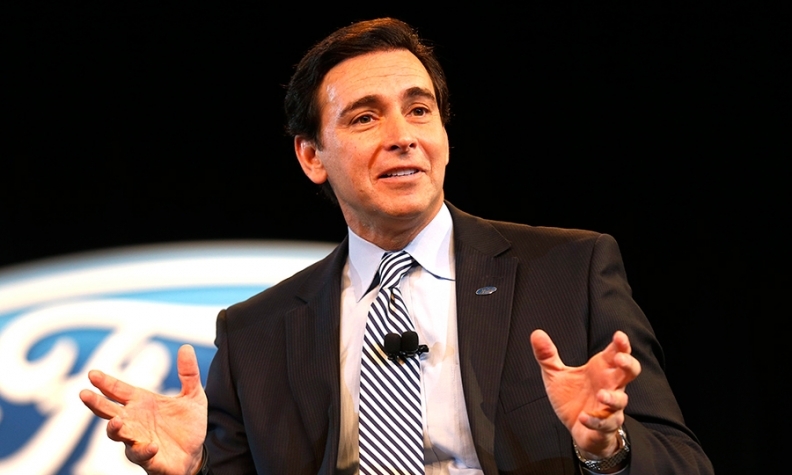 DETROIT -- Ford Motor Co. today named Mark Fields to replace Alan Mulally as CEO on July 1, handing the reins to a 25-year company veteran after being saved by an auto industry outsider. “From the first day we discussed Ford’s transformation eight years ago, Alan and I agreed that developing the next generation of leaders and ensuring an orderly CEO succession were among our highest priorities,” Executive Chairman Bill Ford said in a statement. Fields, 53, emerged as Mulally’s likely successor when he was promoted to COO in December 2012. The New Jersey native was tapped to become Ford’s No. 2 executive after leading the automaker’s North American operations from deep losses to record profits. “Thank you for leaving us this gift of a transformed Ford that we can all build on going forward,” Fields said to Mulally during a news conference today. "I'm so blessed to be surrounded by a talented management team." Fields said his COO position won't be filled. Mulally also will be giving up his Ford board seat. Bill Ford, in an interview later this morning on CNBC, acknowledged the company looked at external candidates. "Clearly I did look outside because I have to, but you know, I kept coming back internally, as did Alan, to Mark," Ford said. "He’s part of the culture of Ford that is so positive." Mulally, in a CNBC interview, said Fields has been the clear front-runner for the job. "To watch him step up and do this job, and with his belief in the strategy, we have the right guy at the right time to take Ford forward," Mulally said. Ford and Mulally also said they mutually agreed to make Mulally's departure a "clean break" as of July 1 rather than keeping an outgoing CEO on the company's board. The transition will bring an end to a storied chapter in Ford’s history. Shortly after Mulally arrived from Boeing Co. in September 2006, he carried out a plan to borrow $23 billion to see the company through the rough times ahead. The loan allowed Ford to avoid the bailouts and bankruptcies that befell the predecessors of General Motors Co. and Chrysler Group. Ford has earned $42.3 billion in the last five years after losing $30.1 billion from 2006 through 2008. Last year, rising sales of Escape SUVs, F-series pickups and Fusion sedans helped drive Ford’s pretax earnings in North America to a record $8.78 billion. Ford’s first-quarter net income this year fell 39 percent, marking its weakest quarter since 2010. Mulally, 68, who had repeatedly said he would stay at Ford through the end of the year, decided to accelerate his departure because of the “readiness of Ford’s leadership team,” according to the statement. Mulally has been lining up a substantial corporate position for his next act, probably as a board director or chairman, people with knowledge of his plans have said. Mulally declined today to comment on his plans after retirement. "I'm not speculating on anything today," Mulally said in an interview, noting he is still focusing on the transition at Ford. Mulally wants to remain a player in the corporate world, giving voice to the importance of manufacturing and innovation in America, the people said. Over 45 years at Boeing and Ford, he became a specialist on management and doing business in Asia, advising President Barack Obama on international trade. Fields, who will be president as well as CEO, has engineered a few turnarounds of his own in his 25 years at Ford. Fields’ greatest challenge is following Mulally. After Mulally considered becoming Microsoft Corp.’s CEO last year, investors became eager for Ford to make the transition, Michael Levine, a fund manager at Oppenheimer Funds Inc. in New York, said last month. Mulally pulled out of the Microsoft race in January and said he would stay at Ford through the end of 2014. Fields, who will be president as well as CEO, has engineered a few turnarounds of his own during his quarter century at Ford. At age 39 in 2000, Fields became CEO of Mazda Motor Corp., in which Ford had a controlling stake at the time. He led a turnaround at Mazda with several Ford executives with whom he later worked closely to revive Ford’s North American business. When asked about the Microsoft job, Mulally told CNBC he was asked by the tech company's leaders for advice "on a number of things, and I was pleased to provide that." "I have never been looking for another job," Mulally said. "My most important commitment was to serve Ford." Keller attended a meeting last month that included several Ford dealers who held Mulally and Bill Ford in equally high esteem, she said. The dealers viewed the chairman as helping to ensure that the new CEO would remain on course -- a key point amid questions about what leadership style will be adopted by the relatively young Fields, who thrived under both the top-down leadership of CEO Jacques Nasser and the more collaborative style of Mulally. Alex Trotman delayed his retirement in the 1990s, unable to groom a successor. He was followed by Nasser, whose attempts to remake Ford into a consumer-products company were undone by Bill Ford and Mulally. Nasser’s tenure ended in 2001 after crises with SUV rollovers caused by faulty Firestone tires. Bill Ford spent his own CEO tenure trying to turn around a company that was unprofitable and mired in its third restructuring in less than five years. In 2006, he stepped aside, plucking Mulally from outside the industry to shake up a moribund corporate culture. The latest transition would continue the trend Bill Ford started in 2006, Jeffrey Sonnenfeld, associate dean of the Yale University School of Management, said in an interview. Said Sonnenfeld: “This is classic textbook, done-right, CEO succession." Bloomberg, Dave Versical and Philip Nussel contributed to this report.